In intensive classes that emphasize traditional techniques, you'll master hand-rendering and casting, and analyze and appraise gemstones. You'll acquire the computer design skills now in demand throughout the industry, and learn to design for a high-end collection or create a line of fashion jewelry. And you'll graduate with an in-depth understanding of jewelry design, manufacture, and merchandising, prepared to forge a successful career in this multifaceted industry. 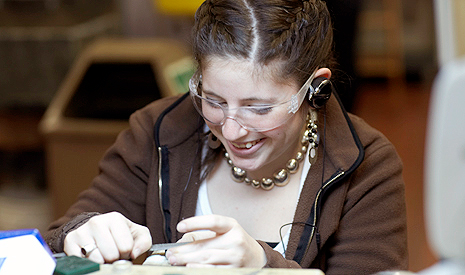 FIT's Jewelry Design program is the only one in the U.S. that offers not only studio courses (metalsmithing), but also design courses that focus on the two-dimensional aspects of jewelry fabrication. A jewelry lab, metal-casting facility, polishing room, silversmith equipment—and a room filled with gemstones, platinum, and other precious metals—simulate a professional environment.